Mary Green admires the purple hues of July. I was so sad to see at the end of May that the lovely flowers on our platform-side bank at Alvechurch Station had been mown down in full flower. This used to happen years ago but after the new station we had an agreement with Network Rail and London Midland that this bank should be left to flower and only cut in the winter. It had just come back to strength, especially the moon daisies but also the wild strawberry, trefoil, wild carrot and other plants. It’s just another example of how people in organisations don’t seem to understand how to maintain a habitat, which needs to be done consistently over the years. Something similar happened in Old Birmingham Road in Alvechurch. On the verge here is an unusual type of buttercup called goldilocks, which is becoming rare. I wrote about it last year, with a poem. This year they mowed the whole verge down in early May when they were in full flower. Elsewhere the mowing seems to have been quite sympathetic, with just a foot or so mown in the flowering season and the rest left to flower. So, there has been beautiful cow parsley in Withy-bed Lane and some lovely cowslips on Birmingham Road opposite the school this year. And the mowing on Hopwood motorway roundabout has allowed the moon daisies to flower. A somewhat opposite thing happened at Bittell. Here the Canal and River Trust mowed down some growing rare bee orchids last summer. They promised never to do it again, and they haven’t. But they should have cut the grass once in the winter, to maintain the meadow-like habitat. They didn’t, so this year the orchids are struggling with the bigger, stronger plants. However, some of them have succeeded in flowering, though you have to look hard to find them. It’s not rocket science, but it seems difficult for people to grasp that you shouldn’t cut down flowers in the growing season – any more than you would chop down little birds or animals. But many flowers of open ground benefit from a winter cut, after flowering and setting seed, which mimics the effect of haymaking or grazing. The little birds are doing well this year. As well as ducklings and a family of swans, we have some successful moorhen broods locally, and more goslings than last year. The moorhens especially seem to have got the hang of nesting in more private places this year. It may be that the canalside vegetation has now grown back to just the right kind of plants and thickness of cover. In July, everything comes into full colour. The green of the trees becomes heavy and strong, so there won’t be many things flowering underneath them. The best flowers are out in the open, in fields, on verges or along canals and rivers. It’s here that you will also see the insects, one of the pleasures of July. But the birds will have gone quiet, and some of them will have lost their bright colours. Purple is one of July’s colours. It’s such a magnificent colour that it has become symbolic of royalty and riches, and also of love and passion. By the canal the flowers are now on the aquatic fringe rather than next to the hedge. One of the best of these is purple loosestrife. It also grows in wet fields and by rivers. It’s a huge long head of small flowers, a bit like our own native version of buddleia. It attracts bees and butterflies and other insects in dramatic fashion. The name loosestrife indicates that the plant was thought to have the properties of promoting calmness and peace – of loosening strife. It used to be plaited into the manes of teams of horses to help them co-operate together. It is probably the plant referred to by Shakespeare as “long purples”, which he says the shepherds “give a grosser name” to! Below the loosestrife you will find marsh woundwort, smaller but a similar shape, an old herb used to staunch blood. Water mint, in the same family, may be growing in the water. And alongside will be greater willow herb and rosebay willow herb, flowers of high summer. In fields and banks where the land is not disturbed is another purple flower. This is the knapweed, a close relative of the thistle but without the prickles. Like all the daisy family, its “flowers” are made up of many small florets, each of which carries nectar and pollen to attract the insects. There are two kinds, a smaller and a larger one, the latter quite spectacular. Knapweed grows really well in Eades Meadow at this time of year and is often covered with the beautiful red and black burnet moths. There are also lots along the Droitwich canal near Hanbury wharf, and near Alvechurch station. Knapweed is also called “hardheads” in recognition of the solid round head the florets come out from. These can be seen well into the autumn and winter, giving an attractive structure even after the flowers have gone. There is a rarer small cousin of knapweed called saw-wort, which grows in Eades Meadow. It is very attractive: the hard head has prettily-marked scales and it has short purple florets. Thistles are the commonest purple flower in July. They are everywhere. I don’t know why people dislike them so, as they are one of the most important species for bees, butterflies and other insects, which they are always covered with. Their prickliness makes them great survivors, as they are difficult for animals to eat. It also stops people picking them. Some of them are extremely beautiful, though unfortunately many of these, such as the woolly thistle, only grow on chalky soils. Here we get the spear thistle, creeping thistle and marsh thistle, among others. 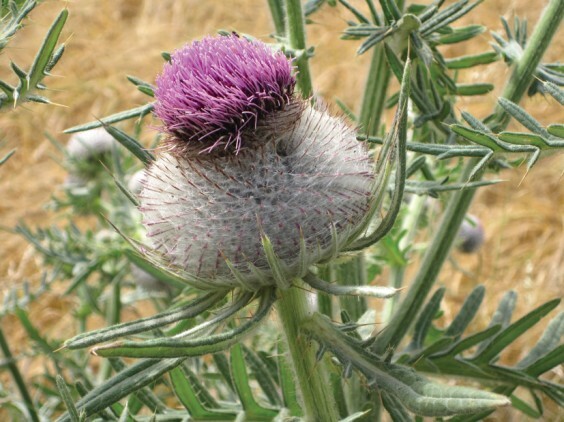 The spear thistle is probably the source of the famous thistle of Scotland. I have a very comic tea towel headed “wild flowers of Scotland”, in which all the flowers are kinds of thistle! This shows how tough they are, surviving in our harsher climates. Teasels are like bigger thistles, with a lovely delicate ring of purple flowers round their prickly heads. They were used to “tease” the nap on cloth, and are also well-defended. And burdock is another well-known prickly plant, with purple flowers, huge leaves, and a root that was used to make the famous drink. The burnet moth I mentioned is one of our most striking day-flying moths. Many moths do fly by day, contrary to popular belief, and many are as beautiful as butterflies. Burnets are red and black, the forewings carrying red spots on a black background. They carry a poison, and their colours indicate how nasty they taste to any predator! Their caterpillars feed on trefoils and the adults get nectar from knapweeds and scabious, so they love meadows. Cinnabar moths are also red and black, with a red stripe and only a few spots on their forewings. The caterpillars have a distinctive yellow and black stripe: both caterpillar and adult are also distasteful to predators. They feed on ragwort. Ragwort brings me to some more of the daisy family. There are lots of tall plants with yellow daisy-like flowers at this time, giving a purple and gold look to meadows. Many of these are in the group called hawk’s beard or hawkbit, of which there are many different varieties that most of us can’t tell the differences between! They are harmless, quite pretty plants of meadowland and verges, and most people just see them as a tall kind of dandelion. They do have flowers like a small dandelion but the shape is quite different, tall and branching. Ragwort on the other hand is more daisy-shaped, with a button-like centre and a ring of outer florets, all in yellow. It grows more on waste land and doesn’t mind disturbed ground. It’s very common along railway lines and some of the varieties have definitely spread along railways in the past. It is actually very attractive – I once saw bunches of it for sale in London - but most people hate it. This is because it is poisonous to animals, especially horses and cattle. If growing it doesn’t cause harm, because the animals will avoid it. The trouble is if it is dried, as in hay or if pulled up and left, because then the animals will eat it. Horses have died from it. So, leave it alone, or pull it up and destroy it. Other daisy family plants add to the July colour. Tansy is pure gold, like the middle of a daisy without outer florets. Fox-and-cubs is that wonderfully named bright orange plant, now naturalised and common. The other vivid moth you may see is the garden tiger moth. This has brown-and-cream marbled forewings and red underwings with dark spots – the exact colours vary quite a lot. Their caterpillars are the once-familiar “woolly bear” ones which are a favourite food of cuckoos. They like to eat all the kinds of plants we think of as weeds, so I suppose that’s why they are garden moths! I saw one last year at the Tardebigge lime kilns. Along the canal you will see another brightly coloured insect family in July. The dragonflies and damselflies range from brown and gold to electric blue. The most distinctive are the delicate blue damselflies, which you see flying and mating, and the bigger, stronger dark blue demoiselles. The larvae live in water for up to five years, and the adults fly for a couple of months. They were believed at one time to carry a poisonous sting. They don’t, but they do hunt and eat smaller insects. They have declined in recent years due to a loss of wetland vegetation, so it’s really important that places like the canal, ponds and reservoirs are there with their waterside plants. Many male birds lose their colours in July. This is strongest in water birds. Look at the ducks and drakes and you’ll see the mallards all looking like females, though you can tell the difference by looking at the beak colour. The mandarin is even more bizarre, the drake losing its pretty colours and even changing its distinctive perky shape as it becomes quite seedy-looking. The mating season is well past now, so no need for those bright colours. It’s interesting how bright colours are used in nature both to attract (mates or pollinators) and to repel (predators). In the hot July sunshine we see a real rainbow of colour. At the time of the Picnic in the Park some of the Withybed Poets wrote about the then recent terrorist attack in Manchester. This was mine. Or a free taxi home, a rose, a prayer. Flowers of peace, and moorhens call. Then I see the two geese stand together. Down plucked from her breast warming the egg. And I watched it run by them and take to water. Of birth and youth that will come to nothing. Standing together against those who love death. But keep the beauty in their hearts, together.